The high-tech wundercompany has landed - not only on our street corners and in our malls, but also for the first time, on the top 10 of Fortune's Most Admired Companies. (Fortune Magazine) -- "Sorry Steve, Here's Why Apple Stores Won't Work," BusinessWeek wrote with great certainty in 2001. "It's desperation time in Cupertino, Calif.," opined TheStreet.com. "I give [Apple] two years before they're turning out the lights on a very painful and expensive mistake," predicted retail consultant David Goldstein. Yet five years later, at 4:15 A.M., a light flickered on. 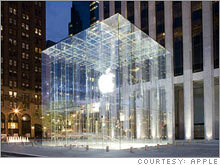 Onlookers were bathed in the milky-white glow of the Apple logo, suspended in a freestanding cube of glass at the corner of Fifth Avenue and Central Park South in Manhattan. Dazzling in clarity and 32 feet on a side, the structure was likened variously to a temple, the Louvre Pyramid, Apple's G4 "Cube" computer, a giant button, and even - in the words of NBC's Brian Williams - Steve Jobs' Model T. But it was, everyone could agree, manifestly a store. 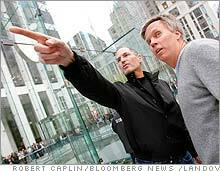 Apple CEO Steve Jobs (left) hired Ronald Johnson away from Target to run Apple Stores. "People haven't been willing to invest this much time and money or engineering in a store before," says the Apple CEO, his feet propped on Apple's boardroom table in Cupertino. "It's not important if the customer knows that. They just feel it. They feel something's a little different." And not just the architecture. Saks, whose flagship is down the street, generates sales of $362 per square foot a year. Best Buy (Charts) stores turn $930 - tops for electronics retailers - while Tiffany & Co. (Charts) takes in $2,666. Audrey Hepburn liked Tiffany's for breakfast. But at $4,032, Apple is eating everyone's lunch. That astonishing number, from a Sanford C. Bernstein report, is merely the average of Apple's 174 stores, which attract 13,800 visitors a week. (The Fifth Avenue store averages 50,000-plus.) In 2004, Apple reached $1 billion in annual sales faster than any retailer in history; last year, sales reached $1 billion a quarter. And now comes the next, if not must-have, then must-see, product. "Our stores were conceived and built for this moment in time - to roll out iPhone," says Jobs, summoning one to the table with a tantalizing I've-got-the-future-in-my-pocket twinkle. If sales are anywhere near expectations - Apple (Charts) hopes to move ten million iPhones in 2008 - the typical Apple Store could be selling, in absolute terms, as much as a Best Buy, and with just a fraction of the selling space. You could say that Apple has landed - not only on our street corners and in our malls but also, for the first time, on the top ten of Fortune's Most Admired Companies. Its peers have watched it upend industries from computers to music. But how did a high-tech wundercompany become America's best shopkeeper? "I started to get scared," says Jobs. Looking angularly trim in his trademark mock turtleneck and jeans (shopping, one is reminded, has never been integral to his lifestyle), Jobs is describing what he saw circa 2000. The company was increasingly dependent on mega-retailers - companies that had little incentive, never mind training, to position Apple's products as anything unique. "It was like, 'We have to do something, or we're going to be a victim of the plate tectonics. And we have to think different about this. We have to innovate here.'" The leap into retail, though, would be from a standing start. "We looked at it and said, 'You know, this is probably really hard, and really easy for us to get our head handed to us.' So we did a few things. No. 1, I started asking who was the best retail executive at the time. Everybody said Mickey Drexler, who was running the Gap (Charts)." Drexler agreed to join Apple's board. Next, Jobs went looking for the one right person to run Apple retail. The answer was Ron Johnson, then a merchandising chief at Target (Charts) who was pushing that company's hugely successful foray into affordable design. "One of the best pieces of advice Mickey ever gave us was to go rent a warehouse and build a prototype of a store, and not, you know, just design it, go build 20 of them, then discover it didn't work," says Jobs. In other words, design it as you would a product. Apple Store Version 0.0 took shape in a warehouse near the Apple campus. "Ron and I had a store all designed," says Jobs, when they were stopped by an insight: The computer was evolving from a simple productivity tool to a "hub" for video, photography, music, information, and so forth. The sale, then, was less about the machine than what you could do with it. But looking at their store, they winced. The hardware was laid out by product category - in other words, by how the company was organized internally, not by how a customer might actually want to buy things. "We were like, 'Oh, God, we're screwed!'" says Jobs. "When we launched retail, I got this group together, people from a variety of walks of life," says Johnson. "As an icebreaker, we said, 'Tell us about the best service experience you've ever had.'" Of the 18 people, 16 said it was in a hotel. This was unexpected. But of course: The concierge desk at a hotel isn't selling anything; it's there to help. "We said, 'Well, how do we create a store that has the friendliness of a Four Seasons Hotel?'" The answer: "Let's put a bar in our stores. But instead of dispensing alcohol, we dispense advice." Johnson is telling the story as he walks the floor of Apple's San Francisco store, a perfect stainless-steel box punctuated by a massive skylight, which is throwing sun on a thirtysomething couple getting a tutorial at the Genius Bar. "See that?" says Johnson. "Look at their eyes. They're learning. There's an intense moment - like when you see a kid in school going 'Aha!'" What else does Johnson see? A guy with a broken laptop. The chances of getting it fixed today are one in three; by tomorrow, two in three. "We're trying to get as fast as the dry cleaner," says Johnson, crossing the glass skybridge that spans the second floor. The most striking thing, though, is what you don't see. No. 1: clutter. Jobs has focused Apple's resources on fewer than 20 products, and those have steadily been shrinking in size. Backroom inventory, then, can shrink in physical volume even as sales volume grows. Also missing, at the newest stores, anyway, is a checkout counter. The system Apple developed, EasyPay, lets salespeople wander the floor with wireless credit-card readers and ask, "Would you like to pay for that?" The interiors, too, have been distilled to a minimum of elements. "We've gotten it down so there's only three materials we're using: glass, stainless steel, and wood," says Johnson. "We spent a year and a half perfecting that steel. Stainless steel can be cold if you don't get the finish right. See the bounce? See the blues up there?" No, frankly, but Apple hunted down a Japanese supplier and pushed it to achieve the effect by blasting the metal with small beads. Suppliers describe working with Apple as both thrilling and scary. "We're used to working on projects with very high standards," says Michael Mulhern of TriPyramid Structures, whose components hold the Fifth Avenue Cube together. "With Apple Stores, everything is two notches above that." And even that doesn't seem to be enough. A few years back Jobs issued a challenge: How small could you make a store and have it still feel big? The resulting "ministore" (not "nano") was just 15 feet wide, with a fabric ceiling that mimics pure daylight. The minis fit nicely into a real estate strategy that Jobs calls "Ambush the customer." He says he wanted to show Windows users "how much better a Mac is. But Windows users weren't going to drive to a destination." That's why Johnson waited so long for the San Francisco location - a corner off Market Street where people live, work, shop, tour, and play, as he puts it. "The real estate was a lot more expensive," says Jobs, but it was worth it because people "didn't have to gamble with 20 minutes of their time. They only had to gamble with 20 footsteps of their time." Downstairs, a man in a hardhat walks in with an iPod nano. Johnson likes this. "When we launched retail, there was a real cult-of-the-Mac mentality," he says. "But our goal was never to have a store for a cult. It was to be a store for everyone. So if you look around here," you see, in fact, the sort of group you'd see in diversity-recruiting brochures. Nor does the store feel like a cult. A club, maybe, in the sense that owning a Mac means joining something. Apple wants the purchase to be the beginning, not the conclusion, of a beautiful - and, it hopes, profitable - friendship. "Apple has changed people's expectations of what retail should be about," says Candace Corlett of WSL Strategic Retail in New York. "After they've seen Apple, how do they feel looking at a drugstore or the jeans section in a department store?" Other companies are asking themselves the same question. Saturn's car showrooms, general manager Jill Lajkziak told the Detroit News last spring, would have a "more contemporary, more interactive look and feel--like an Apple Store." And several doors down from the Apple Store in the Palisades Center mall in West Nyack, N.Y., is a COMING SOON sign with another familiar name. It's one of two stores Dell (Charts) is experimenting with. Sorry, Michael: Here's Why Dell Stores & oh, never mind. Apple, meanwhile, has not returned the compliment by taking cues from others. "Why copy when you can create?" asks Johnson. The Genius Bar, for instance, is now complemented by the Studio, staffed by "Creatives" who offer one-to-one training on everything from putting together your Def Leppard tribute on iMovie to how to deejay your friend's wedding. That's what makes Apple such a hard study: The subject won't sit still for its portrait. "I can't even remember Apple without the stores," says Jobs. It's a statement of how integral they've become to the company; 8,000 of Apple's 20,000 employees, he notes, work in retail. But it's also a reminder that what we're glimpsing are his taillights. It's customary, at this point, to say what could go wrong - a string of product misfires, some future Apple backlash, who knows? But the best way to predict the future is to invent it. "Genius sits in a glass house," the Swiss artist Paul Klee wrote. It's on the corner of Fifth Avenue and Central Park South, and anyone can wander in. Jenny Mero contributed to this article.